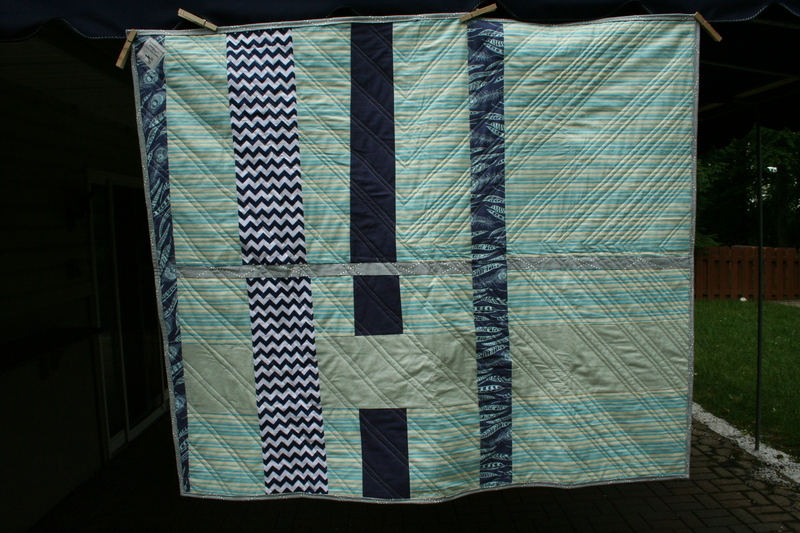 This is a very special baby quilt for some wonderful friends living on the west coast. Little Wyatt was born at the end of April, and his parents are photographers and camera operators who know design, so I put some pressure on myself to make this quilt extra chic and modern. 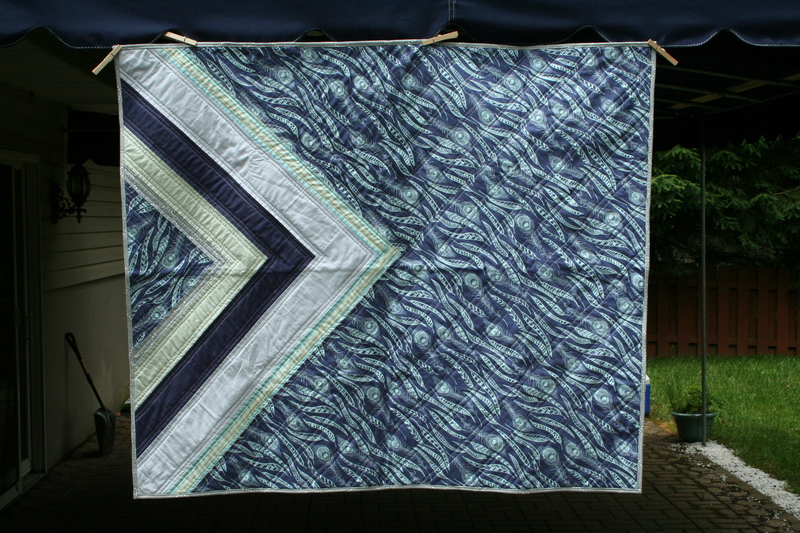 I had extra blue in my stash, including a bunch of these great feathers from Anna Maria Horner, so I used that as a base fabric and put in angles of all shades and widths using the same technique as the back of the Technicolor quilt. 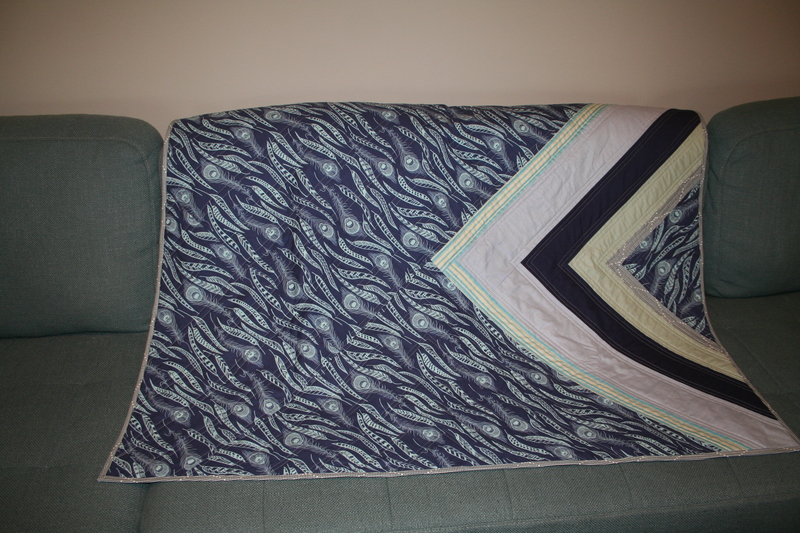 I had so much fun quilting the angles. The striped yardage was just a tiny bit too small for the back, so I inserted some of the fabrics from the front, plus my favorite navy chevron, to the back in a woven design. I loved how the quilting looked from the back. I know that Wyatt won’t need to keep warm in L.A. in June, but I love this size for tummy time. As always, my boys had to dance on it before it could go to the post office. Hooray for a finish! Have a great weekend. Wow, you have outdone yourself on this one! Stunning! Wyatt is a lucky boy. Love. I also love the AMH feather print. Nice. Thanks! I cut it on the bias and couldn’t believe how much the direction affects the way it looks. Such a great print. lol! 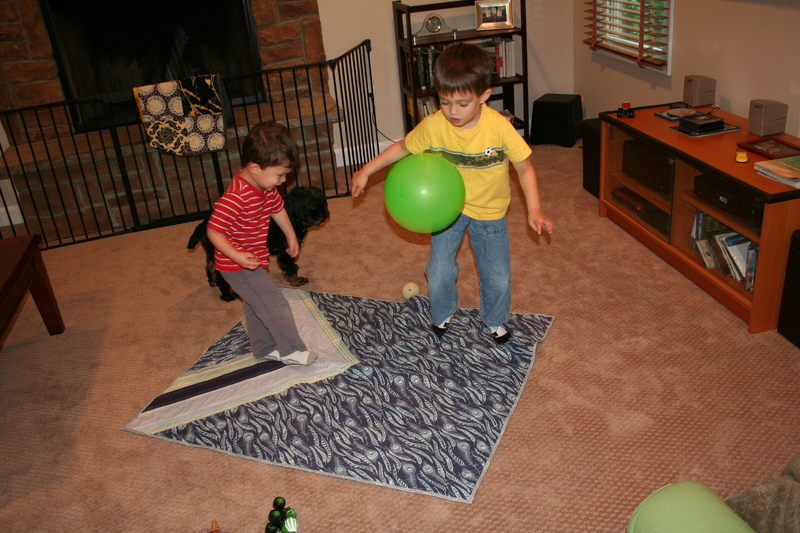 My kids totally dance (and sometimes pee, spit up and/or throw up ) on finished quilts! I love this quilt you made! Thank you Renee! The dancing has become a part of the quilt making process. I tell them over and over not to touch it til it’s done, then they just go nuts. It stinks when fluids get on them when we’ve put so much work in, but it means they’re well loved. Plus, I tell myself, they get softer with every wash. 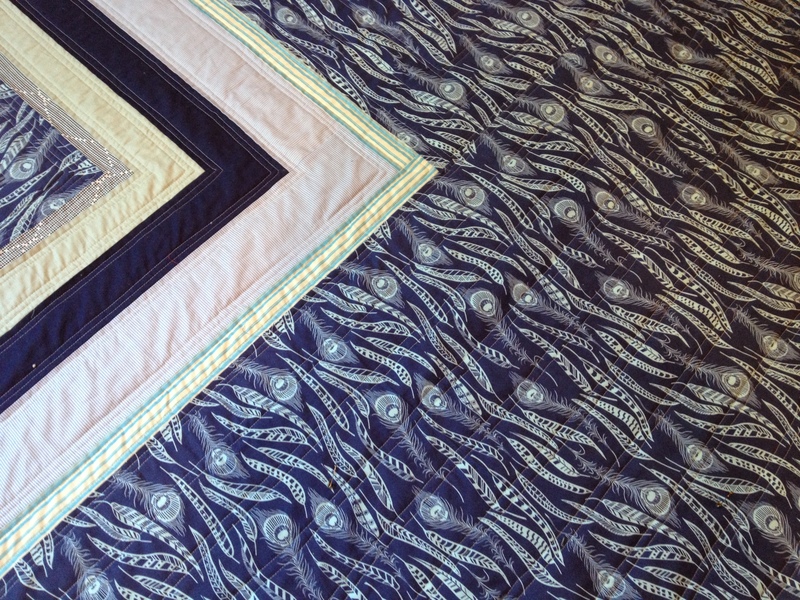 This quilt is my favorite of yours, which is saying a lot :). I still need you to share measurements with me! Wow, that is a great compliment. Thank you. I bet it helps that you were there when I finished it! 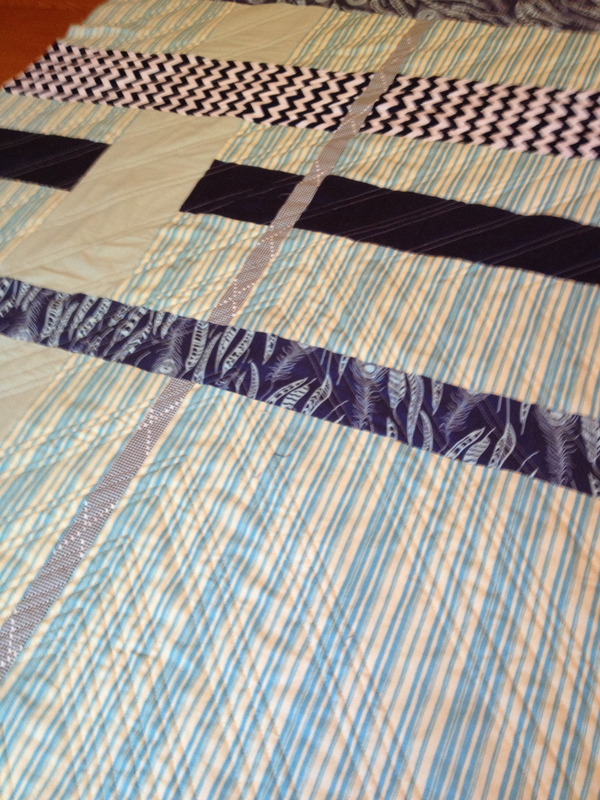 As for measurements, I started with a ten inch square and played with the width and placement of the stripes. For the inner angles, WOF is more than enough, but for the bigger ones I pieced some strips. Maybe a n angle tutorial is in order! Dang girl. That is gorgeous. Cutting the AMH on the bias was genius….it has so much motion to it! And the back is just Front #2. It looks amazing. I can really feel your experience and style coming through on this one. It’s my new favorite. I wish the bias cutting was my idea, but I did it out of necessity and it looked better! Happy accidents are the best kind. I really like both sides of your quilt.